Not too long ago I wrote a post called “The Friend/Follower Quantity vs Quality Debate – A Definitive Guide” where I discussed the importance of having a large enough social community around your Twitter and Facebook, as well as the requirement that they be a highly targeted audience. You must have a large enough audience that enables you to create enough relationships and conversations that will drive ROI for your social media marketing. An analogy I use for this is; Image you have a radio spot you need to place on a station, and you find a station that has a perfect audience for your target market. Now imagine that the station only has 40 people in that audience. Even if you get a 20% response rate, you will never be able to achieve any sizable numbers. Social media is similar, in that you must build a large enough and highly targeted audience to make the medium effective for your purpose. What got me thinking about this was a close friend of mine here in Portland, Oregon, Thubten Comerford. 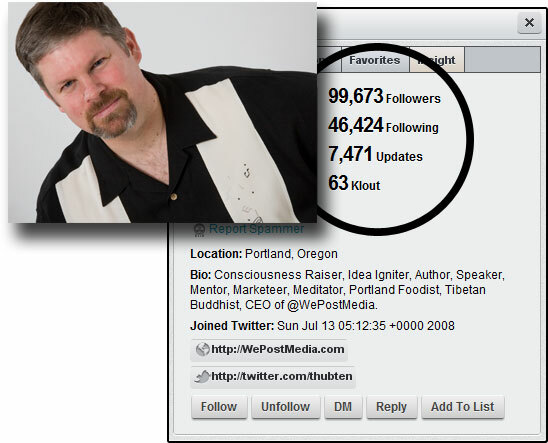 Not only is he a master user of Linkedin (last I checked, ranked 75th worldwide for connections), but he recently passed a huge milestone for followers on Twitter. One Hundred Thousand. Yes, I said 100,000 followers! Though Thubten and his firm WePost Media are exceptionally experienced with social media and social media marketing and consulting, they have created a niche segment in the industry of growing client communities. Clearly, they do it exceptionally well. Aside from having an overall social media strategy, you also need to include plans for activity levels, content and subject matter, posting frequency, as well as community building. They all work together and are intricate components that make your social marketing efforts effective, or not. Miss a component of the mix and your results will suffer. Do them together and consistently, using a well thought out strategy and plan designed to rapidly grow a highly targeted audience of customers, prospects and influencers, which will dramatically impact your ability to acheive return on investment within the medium. What’s your strategy for building a targeted follower/fan base within your overall social media strategy? Is 100K followers targeted? Im not sure how many people you need to manage that large of a number. Makes me start to question the impossibilities social media introduces rather than the possibilities in that you cannot respond to, interact with and engage that many people. You just cant. Building a community is one thing, but building a list just to build a list is quite another. My strategy? Start with a targeted list of people that influence you as a professional and influence your target audience. Observe how they are using social media and who they are connected to. Start jumping into the conversation and share cool stuff you find that they may find interesting. Never mention your company or products unless they specifically ask you to. Become a content curator and tag your tweets. Participate in groups on LinkedIn and connect with other professionals (if it makes sense, I would never connect with everyone for the sake of it). Curious to hear how others go about doing this. So much I could say here I don’t know where to start. Instead I will bow out and let u have the stage. Robert – As you know I continue to struggle with some of the social nmedia discussions. One issue is that it is so difficult to take general principles and apply them to specific businesses. There may be some businesses that have 100k followers and only have to engage at the aggregate level (all small boat owners in Key West, FL have pretty much the same risk profiles and insurance needs so perhaps broadcast content to them is fine as opposed to individual touch). Other businesses may depend much more on 1 to 1 connections to convert followers to buyers and in that case, I would worry about how to manage that kind of engagement with 100k followers! That said, it sounds lik eit would be a great problem to have. A large engaged audience waiting for you to convert them to revenue.